For more resources on TBI, scroll to the end of this post. From Elaine Wilson, Family Matters Blog Editor: I’d like to introduce guest blogger Army Staff Sgt. Victor Medina, who sustained a moderate traumatic brain injury during his third deployment in Iraq in 2009. Several months later, Medina started a blog titled “TBI Warrior” to help educate other survivors and caregivers affected by a brain injury through his own experiences — before and after TBI. He shared his story in a Defense Centers of Excellence Blog on March 2. The mission of Medina's blog "TBI Warrior: Traumatic Brain Injury is a New Beginning. IT WILL GET BETTER" is to: "provide insight on Traumatic Brain Injuries from the perspective of a survivor and a caregiver. Empower survivors and caregivers through education, providing resources to heal with hope. We stand for early identification and appropriate intervention with compassion. The survivor's knowledge and motivation are key to successful rehabilitation." In Medina's blog, he makes a good point with referenced arguments that the diagnoses of PTSD and TBI, while often diagnosed together, are separate conditions and diagnoses. He makes the point that if you have a TBI you may or may not also have PTSD. It is okay to have one and not the other; the conditions are not "comorbid". See his blog for the entire thoughtful argument. The Defense Centers for Excellence has a great resource page on Traumatic Brain Injuries. It includes links to some videos and more links to finished studies or ongoing related research. In honor of Brain Injury Awareness Month, there is a related DoD webpage for more resources that include Fact Sheets, ICD-9 coding guidance on TBI for providers, and mobile apps for health care providers. This includes the fact sheets "Courage to Care--TBI: What Military Families Need to Know," and a TBI statistics sheet. Want to learn what the mechanics of a blast, such as an IED are? Check out the "mechanics of a blast injury" video on the BrainLine Military website. 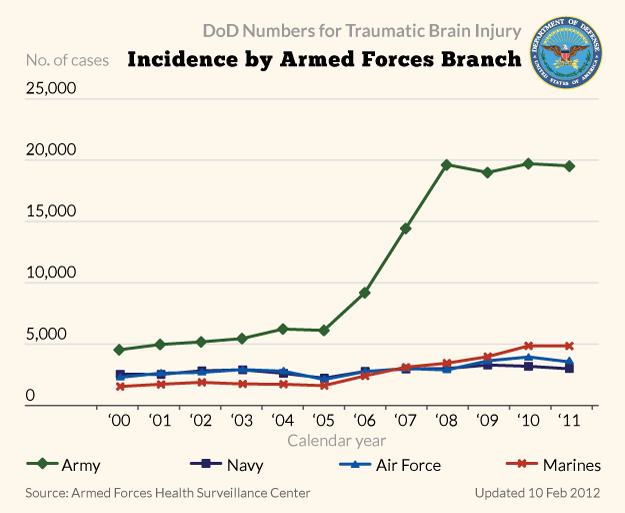 Courage to Care's fact sheet "TBI: What Military Families Need to Know"
Some nice graphs with data on TBI from the Department of Defense as recent as February 2012. The National Instutite of Health's Research on TBI page. This is a special branch called the "National Institute of Neurological Disorders and Stroke". 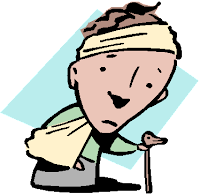 There is a cool interactive website for learning about the brain and brain injury called BrainLine. American Heros at Work is a U.S. Dept. of Labor project that addresses the employment challenges of returning Service Members and Veterans living with TBI and/or PTSD. "Mechanics of a Blast Injury" video on BrainLine Military. DVBIC = The Defense and Veterans Brain Injury Center, a DCoE component center, offers medical care, research initiatives and programs to active duty military, dependents and veterans. Information on brain injury and associated research and treatment. More reading lists on TBI, "Take Note program"
Post-combat Driving program for servicemembers and their families. 2013 post on DoD numbers for 2012 update with more detail than image below.